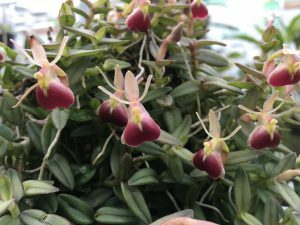 This miniature species from Colombia and Venezuela that produces single flowers from the top of 4cm growths and can make an impressive flowering plant in a 3cm pot. In nature it is an epiphyte in oak forests from 600m to 2700m altitude. Plants also do well mounted and we grow some plants into specimens that completely surround their cork mount with lovely little flowers held out for their humming bird pollinator. The target for the humming birds beak is the green/yellow V at the top of the red lip and there are two beak guides either side of the opening to the nectary. We find this a very accommodating plant that grows equally well in Warm or Coll Americas and flowers well both when grown in good light and in semi shade. We keep plants well watered but in a free draining compost or mounted so that plants can dry out soon after watering.